"The User-Agent request-header field contains information about the user agent originating the request. This is for statistical purposes, the tracing of protocol violations, and automated recognition of user agents for the sake of tailoring responses to avoid particular user agent limitations. Although it is not required, user agents should include this field with requests." In this post, I am going to show you some examples which use the User-Agent to transmit information in this HTTP field. In this example, the malware creates a visual basic script which will be running to connect with the C&C server. We talked about it in the last post Decoding the code encoded. In this case, I could edit the the visual basic in order to change the C&C domain name by the localhost 127.0.0.1 address where I have a netcat listening in the port 80. Netcat will receive the malware connections instead of the C&C server. In the picture below, we can see the result. This line corresponds to Netcat running in the computer where the malware is being analyzed. It is listening "-l" in the 80/tcp port "-p 80". We can see the connection executes a POST request. I sent a malware sample to my Cuckoo Sandbox to analyze its behavior and I got a traffic capture. If we use Wireshark to see the connections in the traffic capture, we can filter by "http.user_agent" to show only the information about the requests made by the malware which contains this field in the HTTP connections. You can see these connections in the picture below. Right-clicking in each HTTP request, we can select "Follow TCP Stream" in order to see the data in like the application layer sees it. In the picture below, we can see the Follow TCP Stream of the first connection. A GET petition including the MAC address of the infected host has been made. Normally the malware sends information with POST connections, but in this case, the malware request a URL with contains the infected computer's MAC address to send this information to the C&C server in a different way... The MAC address will be register in the remote HTTP server logs. The User-Agent its the same that the name of the malicious executable. Maybe the malware developer has the same malmare hosted in different servers and he wants to trace them or maybe wants to know the malicious program version. In the GET connection, the infected host receives three codes: 1,1,0. We would need to dig on it making a reversing engineer to try to figure out what the malware exactly does with these codes. The next petition the compromised host does, is to make another GET request to the C&C server. We can see another GET request including the MAC address. Now, the HTTP petition has tree fields: "v1", "v2" and "v3". The connection continues using the same User-Agent. Now, the the host receive the "0" code. In the picture below, we can see that in the next request made by the malware, the User-Agent has changed. The malware visit "/version" path. We can see four different executables separated by @date| . Maybe it is the date when they were compiled. The next connections are related with the last request which I have described above. We can see how the malware request the same executables it received before. The question here is why it download them twice each binary. The malware downloads the four executables and changes its User-Agent again when it is requesting them. The URL path where the malware is hosted. User-Agent is changed to "installer-agent". The last connection the malware does is the same that the second one. This malware seems to use the User-Agent like it were a radio announcer. 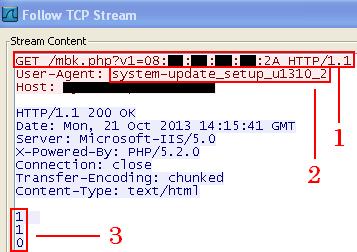 This example came from the Fireye blog and belongs to the well-know Flamer malware. This example came from the Fireye blog too. In the picture below (taken from the Fireye blog) we can see that the User-Agent contains the strings "sleep 300000" and a date"ct:Mon Feb 25 23:11:58 2013". It could be possible that the zombie computer is telling the C&C how much time the malware has been sleeping and from what day or maybe it informs to the C&C sever that it received the sleep command. In this post we have seen how the malware exchanges information with the command and control servers using the User-Agent and the importance of this HTTP field. Many of them do not modify its User-Agent or implements a well-known User-Agent to try to be undetectable, but if it changes you can create a custom signature for you IDS (Snort, Suricata...) in order to locate more infected hosts in your network which are making connections with the User-Agent customized by the malware. Interesting read, answered exactly what I was trying to find out about the use of User Agent fields. As a side note, instead of editing the script you can run something like APATEdns by Mandiant, INETsim (requires a second VM / machine), or the wonderful FakeNet by the authors of practical malware analysis. 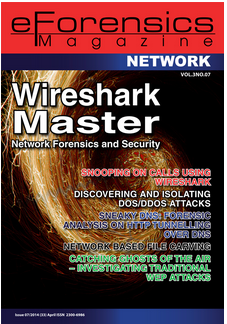 FakeNet could also replace nc in the first circumstance (and wireshark, as it creates a pcap file of the activity). 0" in chunk encoding means the chunk size is 1 (the first 1) and value is 1 (second 1), the 0 means the end chunk. Effectively the server just returned 1 byte "1".